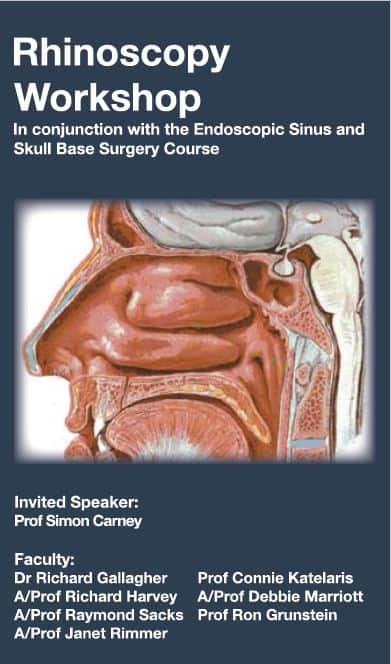 The Rhinoscopy Workshop is held in conjection with the Endoscopic Sinus and Skull Base Course, and takes place in the 3rd week of August at St. Vincent’s Hospital. 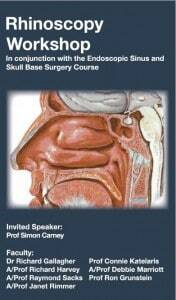 This course runs during the third week of August in conjunction with the sinus course. Please contact Margi Griffiths for an application form or this year’s course details. The course is aimed at respiratory physicians, immunologists, allergists and other specialties who are interested in the diagnosis and management of upper airways disease. There is a focus on integrated medical and surgical management. Modern concepts of airways disease, inflammatory processes and an evidence-based approach are key discussion points. For more information, or to register, download the registration brochure.